As if summer couldn't get hotter! SUR, Sodo's newest nightclub and restaurant fires it up with its heavy Latin influences. Note: this is not the typical beer-swilling, baseball hat-laden venue one might expect south of downtown. Imagine revolving treats of flavor and music from all Latin countries, low lighting, and tables overlooking the lively dance floor. You can thank the staff's own countries of origin for Latin change-ups as much as the owners' passion to share the variety that comes from each of these regions. Case in point: Habana Nights! The evening of Sept. 10 takes the palate and those dancing shoes to Cuba. 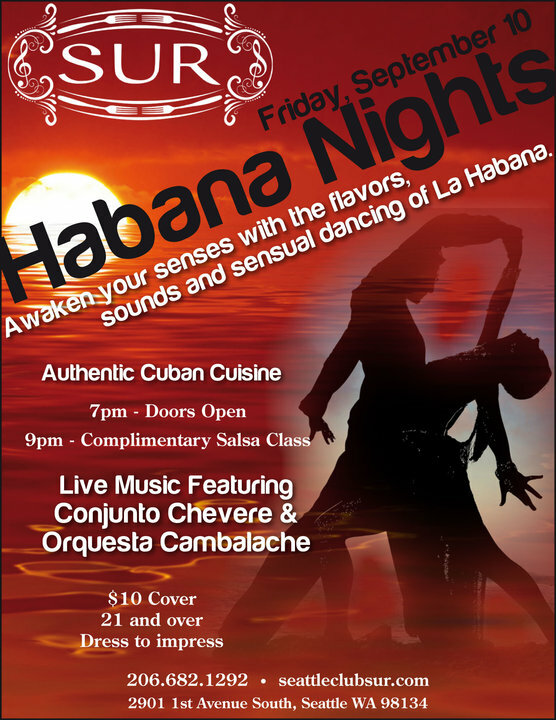 A complimentary salsa class at 9 p.m. is part of your $10 admission so make it happen! Don't be shy.